Image caption Could Welsh MEPs be returning to the European Parliament in Strasburg later this year? Political parties in Wales are preparing for European elections as Brexit uncertainty continues. Plaid Cymru said it was "ready" for the vote at the end of May, while UKIP said it was on an "electoral red alert". Liberal Democrats also said they're making "the necessary preparations". The Conservatives said they had "no plans" for participating in the elections and Labour MEP Derek Vaughan said his party had held no discussions about standing in the polls. The news on the election preparations came as the prime minister was in Brussels, where the other 27 EU leaders agreed to postpone Brexit beyond 29 March. In a statement in Downing Street on Wednesday night, Theresa May said she was "not prepared to delay Brexit any further than 30 June", partly because that would mean the UK would have to take part in European Parliamentary elections. The EU Council President Donald Tusk has suggested that a short extension to the Brexit process could not go beyond 23 May - when European elections will be held - and is conditional on MPs backing Theresa May's Brexit deal next week. If MPs reject the deal, then there is confusion as to what will happen next, but options include a longer extension with the UK holding elections for the European Parliament. Plaid Cymru MEP Jill Evans said the party was preparing for European elections. 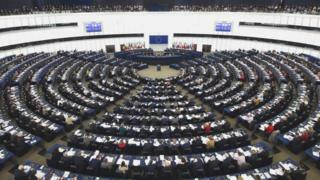 The MEP since 1999 added: "They probably won't happen but they may and so we have to be ready. We are ready. We'll have our candidates and I will be one, I hope, and we are ready to fight the election." A UKIP spokesman said the party was on an "electoral red alert" but added that a decision had not been "finalised" as to who its Welsh candidates would be in any forthcoming election. The spokesman said the selection process would be completed within the next "couple of weeks". A spokesperson for the Welsh Liberal Democrats said the party was "currently in the process" of selecting candidates, whilst Nathan Gill has already confirmed he will stand for Nigel Farage's new Brexit Party if the UK's departure from the EU is delayed. Derek Vaughan, Labour's Welsh MEP since 2009, said he was prepared to stand for the elections but that his party has not had any discussions about candidate selections. Asked about preparations, a Welsh Labour spokesperson said: "If European Union elections need to take place, it'll be because of Theresa May and the UK Government's failure to negotiate a deal to leave the EU." A spokeswoman for the Conservatives said the party had "no plans for participating in the European elections".